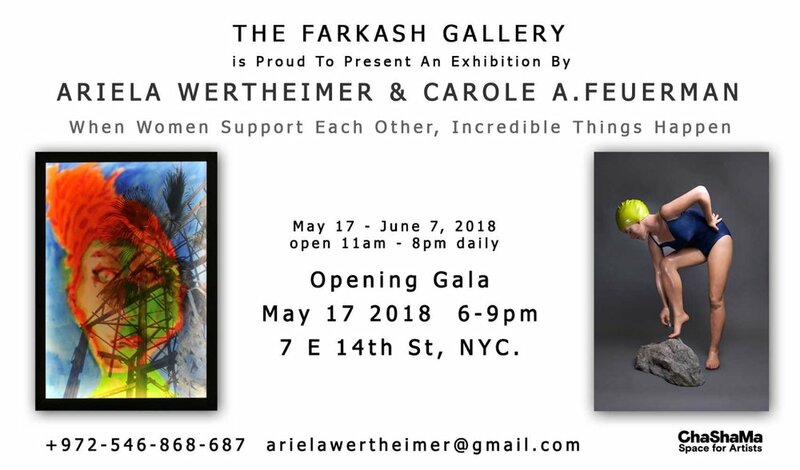 On May 17th Carole and Ariela Wertheimer opened a show at The Farkash Gallery on 14th Street. The show was called When Women Support Each Other, Magical Things Happen. Wertheimer is an Israeli artist who met Carole at Art Basel in Miami, although she wrote that she had been encountering Carole’s sculptures across Europe for some time before they met in person. In the space, several of Carole’s Swimmers were surrounded by Wertheimer’s hanging light boxes from her Lightbox Portraits series. The light boxes each present two images: photographs that Wertheimer captured in Jaffa, a port neighborhood of Tel Aviv, along with transparent painted portraits and other illustrations that are overlapped with the photos. From one perspective, Swimmers and Lightbox Portraits are linked in a liminality, a between-ness. Carole’s Swimmers, captured recently emerged from the water and still dripping wet, seem frozen between different moments, while the port architecture and bodies that Wertheimer shows seem caught between different worlds. However, I think the most important connection between the works is in the intimacy of each specific piece. Maybe that intimacy is rooted in liminality: theorists of religion like Victor Turner have offered that the liminal space that exists inside of a ritual is a sacred place to encounter a substance of our self temporarily released from social structures. Maybe in the between-ness of Carole and Wertheimer’s portraits we find the unbridled self of their subjects: the private aggression of Wertheimer’s The Neighbor in the Neighborhood, the self-assured curiosity of Carole’s The Message. Talking with Carole and reading Wertheimer’s writing on the show, they seemed pleased and enthusiastic about the feeling of being led to one another’s work, about the confluence of fate and hard work that produced the shows “magic”. The opening was definitely a magical night with a crowded room and many tasty drinks and snacks circling around! If you’re in New York in the next month, you can stop by The Farkash Gallery from 11 to 8 daily to catch the show. Have a look before it comes down June 7th!